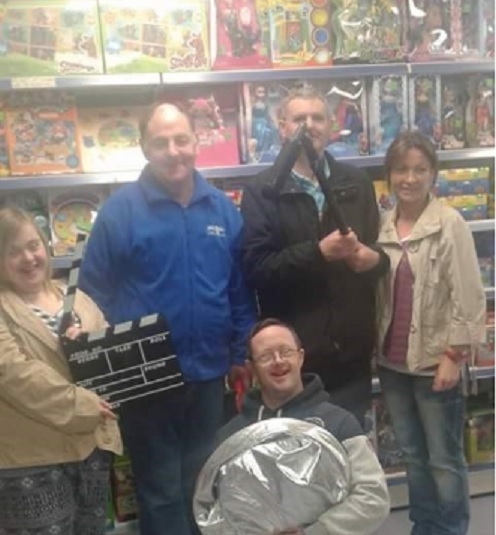 Media Lab is a new, innovative production company which specialises in training people with an intellectual disability how to use the media to empower and express themselves through the use of TV/film, sound/radio production, photography and social media. Media Lab is made up of two people, Catherine Kavanagh and her colleague John Lawless and both give the training in the media classes. We are a mobile production company who can come to your day care centre if desired, or you can come to us. We have a base in Dublin City but can hire a venue in any county around Ireland, where people from centres can come and participate in our six week Introduction media courses. We teach all participants how to take photographs, make a short film, or even record a radio programme, and also learn about social media. We would then hold a screening of the short film, get the radio programme aired on a local radio and have a photography exhibition, to show to family members and the general public. We are in the business of making people smile, and we believe in the abilities of all people to use and have access to Modern Media.